Wow, 9mobile Nigeria now Giving all new subscribers great chance and opportunities to get free heavy and amazing awoof airtime, data, free Whatsapp and more bonus. This free bonus is now fully available for new 9mobile subscribers when they get and register a new sim card. 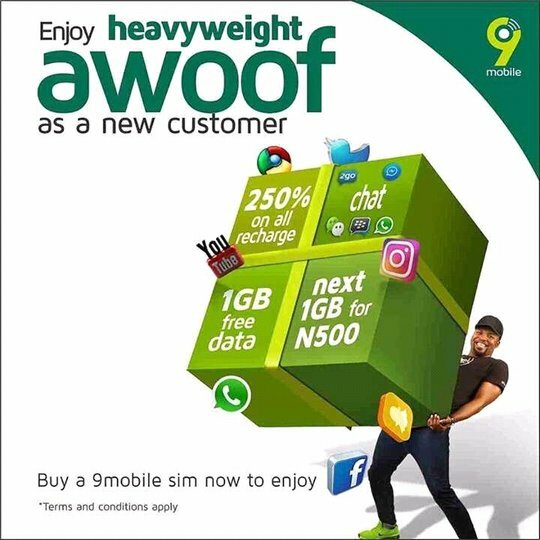 According to 9mobile, The company says on their Official Facebook page as a new customer that purchase any Etisalat/9mobile Simcard and register will have the great opportunities to enjoy heavy awoof bonus and data such as250% on all recharge, Free Social Data plan, 1GB Free Data, and of course customer will also get 1GB Data for N500 and lots more.